How much is it worth to be able to take care of patients without hurting yourself? The stress on the doctor’s body that is eliminated by instrument adjusting can dramatically improve the quality of life and extend ones career indefinitely. And if you think only in terms of income, how much is adding years of peak earning capability worth? The addition of instrument adjusting into a new or existing practice can be an important key to better results, happier patients, more referrals and higher income with less doctor stress and fatigue. When I first adjust experienced chiropractic patients with the hand held percussive and adjusting instruments they are amazed by how comfortable and effective instrument adjusting is. This creates a renewed enthusiasm and a desire to share the experience with others. Chiropractic without joint cracking eliminates a major barrier for many patients. We will never know how many people feel this way, but my experience over the past 10 years tells me that it is a significant number. I consider instrument adjusting one of the most important developments of the last 50 years of chiropractic research and development. It provides multiple benefits for any chiropractor who incorporates it into his practice. Instrument adjusting is not a technique unto itself. The chiropractic adjusting instruments I will discuss in this article are tools that can be effectively used with a wide range of techniques and specialized applications. I have been a proponent of instrument adjusting for more than 40 years. The hand held instruments I use today are incredibly versatile. They are used as an integral part of a number of excellent techniques because they give the doctor the ability to make contacts and apply forces with more control and precision than could possibly be done with manual adjusting procedures. The instruments however are only part of the equation. They do not automate the process of spinal correction. In order to be used properly, the doctor must be trained in their use. Just as in the sport of shooting, knowing how to squeeze the trigger, does not make you a marksman. There are a number of excellent programs that can provide advanced training in techniques which utilize adjusting instruments. 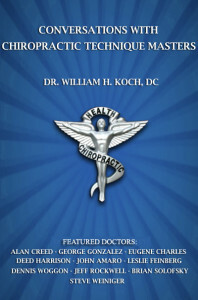 My latest book, Conversations with Chiropractic Technique Masters, discusses several excellent techniques taught by talented chiropractors who are dedicated to clinical excellence. The promise of Chiropractic without the crunch can in many cases be all the incentive necessary to motivate a prospective patient to begin care they were formerly avoiding out of fear. The proper use of the instruments allows us to make effective adjustments without the sounds that many patients find offensive and frightening. I believe that this is more of an issue than most chiropractors think. We are so familiar and comfortable with the audible release that is easy to lose sight of the possibility that some of our patients might not be equally comfortable. In consideration of this it is good to let all patients know that instrument adjustment sans the audible release is a viable alternative. You might be surprised how grateful they are to know they have this option. Several of the techniques I discuss in Conversations with Chiropractic Technique Masters involve a great deal of doctor/patient interaction. Active participation in the corrective procedures provides a point of interest that is not found in the typical adjustment where the patient is present but passive and uninvolved. Patients who actively participate in their care have a greater sense of connectedness and partnership with their chiropractor. This makes them more likely to talk about their chiropractic experience and motivates them to refer friends and family. The decision to add instrument adjusting to a doctor’s practice can be one of the most important that he or she can make for a number of reasons. There is a strictly personal advantage to instrument adjusting. You can eliminate a great deal of stress on yourself. The fact is that manual adjusting imposes a repetitive motion trauma on the chiropractor’s body. The larger your practice, the longer you practice, and the more big patients you see, the greater the probability that you will injure yourself. Chiropractors are sidelined and careers are ended due to injury at a rate comparable to professional football. That is a terrible statistic and is as tragic as it is unnecessary. Thankfully, properly used, hand held instruments help to prevent injuries and lengthen careers. I will be speaking at the Florida Chiropractic Association’s National Convention August 21-24 in Orlando. My presentation is scheduled for Friday the 22nd from 10:20 a.m. to noon. I will be giving a hands-on demonstration of the examination and treatment protocols I use in my practice. I hope to see you there.